A 2 mile walk looking at the regeneration of the Kings Cross area. Work is on-going so you may need to take diversions! York Way, formerly Maiden Lane, was an ancient route between Islington and St Pancras. Kings Place, with a serpentine glass frontage, was designed by Dixon Jones in 2008. Office space finances the public facilities which include two galleries, a 420 seat concert hall plus a smaller hall. There is a large foyer/atrium with cafe, a restaurant and access to the canalside with pieces of public art throughout the complex. The Regent's Canal was completed in 1820. Battlebridge, a hamlet by a bridge over the River Fleet, gave its name to the canal basin. The buildings on the left belonged to Robert Porter's bottling works of 1906 onwards and were redeveloped in 1988-9. The artwork VERT (2013) by Neil Ayling features growing plants. This has a mixture of new build and converted warehouses. The London Canal Museum is housed in an ice warehouse built for Carlo Gatti in the 1860s with two deep ice wells. The front of the building was rebuilt in 1904-6 and first floor stabling provided for horses. From 1926 it became warehousing and light engineering works and during WWII a depot for spare parts for London buses. The Museum Trust took on the building in 1989. The area of water to the rear is Battlebridge Basin, constructed in 1820 and originally surrounded by saw mills, a bottling plant, a jam factory and flour mill. Right at All Saints Street. To the left is Regent's Wharf with reconstructed grain mill buildings and new offices in warehouse style. Further along a red brick office building of the 1890s has a Baroque doorway. Across the road at the end is the Thornhill Arms pub of the 1880s with attractive tilework. Right along the Caledonian Road. This road was laid out in 1826 and took its name from the Royal Caledonian Asylum of 1827-8 for the children of poor exiled Scots. The Driver gastro pub has planted walls and a roof terrace. Right along Wharfdale Road. Left through Trematon Walk. This is part of the Regents Quarter, a redevopment of former industrial premises. This section of the Regents Quarter included iron, brass and copper works. There are plaques in the pathway and a millstone in the central courtyard. These buildings of c1845 lie on the boundary between Camden and Islington boroughs. Above the entrance is 'Works & Mills 1846'. Cross Caledonia Street into the third section of the Regents Quarter. On the right of the entrance is a foundation stone of the laundry buildings that originally occupied the site. There is a large artwork on the left hand wall. Kings Cross Labyrinth was commissioned by P & O Developments in 2004. The moulds were digitally designed by Philip O'Reilly and created in Wales and all the tiles were hand made by Philip at his studio in Peckham. The murals narrative was based on local research in the area and information gathered from English Heritage. The tiles show images based on Barges, Trains, Signals, Parks, Plant life, Novels, Films, Foundries etc, and other ideas associated with the Kings Cross Area. The Scala was originally built as a cinema to the designs of H Courtney Constantine but construction was interrupted by the First World War and it spent some time being used to manufacture aircraft parts, and as a labour exchange for demobilised troops before opening in 1920 as the King's Cross Cinema. The cinema changed hands and names several times through its life and also changed focus, ranging from main-stream to art-house to adult film over 70 years before becoming a night club. The 'Lighthouse' building (Grade II listed) was built around 1875. It may have housed a clock tower, Victorian helter-skelter, or even a camera obscura. Another explanation is that when oysters were a cheap and popular fast food, Nettens Oyster House was marked with a lighthouse. After many years in a derelict state it is being redeveloped for retail and office use. The Great Northern Railway built their London terminus between 1849 & 1852. The 93 room Northern Hotel was opened in 1854 when its curve mirrored that of Old St Pancras Road. It originally had enclosed gardens on the station side. It has been refurbished as a hotel. This has an impressive roof with coloured lighting. A feature has been made of Platform 9¾ which appears in the Harry Potter books. The giant birdcage is an artwork by Jacque Rival called Identified Flying Object. The German Gymnasium was designed by Edward Grunning in 1864-5 as a club and sports facility for the German Gymnastics Society. It was damaged by a Zeppelin Raid in 1917 and in the 1920s it provided offices for the GNR. The front facade was demolished and rebuilt further back for the St Pancras Station extension. It is being redeveloped for restauarnt use by D&D London (opening 2015). The Stanley Buildings were constructed by the Improved Industrial Dwellings Society in 1864-5 to provide self-contained housing for 104 families in five blocks. The roofs were utilised for clothes drying and children's play areas. One block was destroyed by WWII bombing, one removed for road widening in the 1960s, one for works in 2001 (when the buildings were vacated) and the fourth for the realignment of Pancras Road in 2007. The remaining Grade II listed block will have a six storey building constructed around it for retail and office use. On the left One Pancras Square is by David Chipperfield. It has 396 columns made from recycled cast iron by the Hargreaves Foundry in Halifax. It provides an entrance to the tube station along an LED lit tunnel. Two Pancras Square (with roof terraces & gardens) is by Allies & Morrison. Both provide office and retail space. At the end is a viewing platform with illustrated boards to identify sites. The areas alongside the canal have been re-landscaped. On the canalside are the former Fish & Coal Offices (1851/1860s), where clerks dealing with freight through the goods yards worked. The buildings were gutted by fire in the 1980s. Granary Square has 1080 computer controlled fountains with coloured lights. The Granary was designed by Lewis Cubitt in 1852 and is now home to the University of the Arts (public access to part of the building). The Western Transit Shed (also by Cubitt) was used to transfer freight to and from rail carts using cranes and turntables. Stables were located under the loading platforms. The building is now retail and office space. 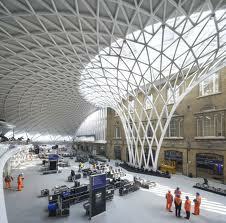 It also houses the Kings Cross visitor centre with interactive model and information on the area (free admission). Opposite are former coal drops (1851 & 1860s). These originally carried four high-level railway tracks from which coal was dropped from wagons into storage hoppers below. They were used for general storage in the 2Oth century, later in multi tenancy use. They will be converted to retail and food outlets. The Platform Theatre is a performance venue for the college. This started with a sustainable vegetable garden built in skips and has expanded into community project which provides opportunities for local youngsters. The fruit and vegetables grown here are sold to local cafés and restaurants and a line of jams and chutneys have been created. The Skip Garden hosts a pop up cafe on the first Saturday of every month from 10am to 4pm and there is a cosy yurt with a wood-burning stove. The Hatch Cafe (Wed - Fri 10-3) opens onto the recreational area behind the garden and serves a healthy menu made from organic produce grown on site. The garden was designed by Dan Pearson Studio on the site of railway sidings. There are seats, a water feature and play equipment amongst the planting and landscaping. To the left is Arthouse providing 114 homes with retail units on the ground floor. The East Handyside Canopy was built in 1888 to provide a covered area for potato traffic. It followed the curve of the 1850 temporary passenger terminus building, later used as a potato market. The Midland Goods Shed was built as a carriage shed in 1850, adpated for the Midland Railway in 1857. It was later used by the GNR as warehousing with offices attached to the southern front in 1870. These buildings will house a Waitrose Store and Cookery School designed by Bennetts Associates (opening 2015). The West Handyside Canopy was built in 1888 to provide a covered area for unloading fish. Railway traffic ceased in the 1970s. Regeneration House, was so named in the 1980s when rebuilt following WWII bomb damage. It was originally the main Good Yard Offices (Cubitt 1850). It has been redeveloped by John McAslan & Partners and renamed 2 Granary Square. The House of Illustration is here together with offices of The Art Fund. From the garden bear left onto York Way and go right. Go down steps to the temporary towpath and follow this to the green steps back to Granary Square. On the right is a 'living wall'. Opposite is Five Pancras Square, the new home of Camden Council with a library, cafe, leisure centre and swimming pools. Right at Camley Street. Just before the bend in the road is the entrance to Camley Street Natural Park. This community wildlife reserve was established in the 1980s on the site of the Plimsoll Coal Drops and is now run by the London Wildlife Trust [website]. Nearby is The Waterpoint on the premises of the St Pancras Cruising Club. This was built in 1872 alongside the railway tracks to provide water to steam locomotives and was designed at the office of Sir George Gilbert Scott. Threatened with demolition during Channel Tunnel works in 2001 it was saved by English Heritage but had to be moved to its present location! The lower storey had to be rebuilt but the top two sections including the former 2,400 cubic foot water tank (now a viewing platform) made the 700 metre journey along Camley Street by specialist transporter. The Grade II listed Gasholder number 8 is also being reconstructed across the canal and will house a new park and event space designed by Bell Phillips Architects. It was built in the 1850s by the Imperial Gas, Light and Coke Company and formed part of the largest gas works in London.